I live in an old country! Wherever I go I’m reminded of this. This ‘piece of sculpture’ is a few miles from my home. 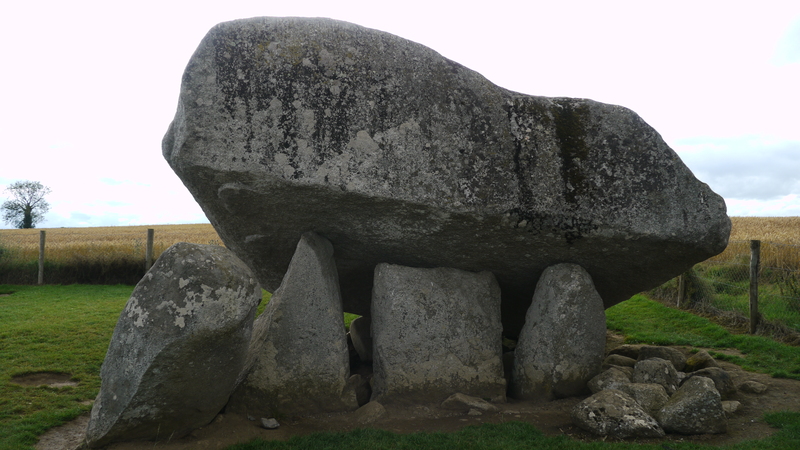 That piece of rock on top is estimated to weigh about 150 tons and possibly the largest capstone on this type of monument in Europe. Those smaller supporting stones are about 6 feet tall. The sheer size of this is work is astounding. Sitting on the side of a hill and visible for miles, it faces east, towards the rising sun. The return of the sun, after night or winter, must have been an important occasion as ‘east’ is a common alignment in monuments of this age. Like all great works of art we are left wondering, how did they do it? It was placed here by a farming community who lived in this area 5000 years ago and it still speaks to their descendants today. The archaeologists say its a religious monument but I suppose future archaeologists will say the same about the Pieta. And what was the greatest achievement here? Its not its physical presence of this great work. Its the satisfaction the creators must have felt when it was finally completed all those years ago. I think the act of creating a work of art is more important than the finished piece. Enjoy your art! This entry was posted in Misc. and tagged Art, History, Sculpture. Bookmark the permalink. This is fantastic. I can imagine people celebrating here. It is amazingly creative to move mountains, don’t you think? Absolutely. Especially moving mountains as an act of veneration and not, as nowadays, for profit. I admire your attitude to your art. Thank you for your comment. I definitely agree that art is as much about the process as the final result. I’ve found that in times of creative ‘block’ sometimes just setting out a process for myself or just ‘doing’ gets the ball rolling. I agree, those rocks are ‘community art’ from 5,000 years ago. Whenever I see ‘street art’ of the unofficial kind – graffiti, I wonder is this a reaction to the often austere and elitist official arts. Is the internet a form of ‘street art’ I wonder, for a wider community. Thanks again.